If there can be such a thing as a hot topic in Aunt Sally it has to be the online score card system introduced last year. I’ve heard some complaints some of which I understand and some of which I don’t. I’m going to take you through a few of the reasons why we, the Committee have introduced it so that perhaps you might understand even if you don’t agree with it. I will say that at the AGM support for the change was voted through in a democratic way by the teams. It’s like this, the Committee at present has 8 members. All of us have been here for many many years and believe it or not it takes some work organising the League and making sure it operates smoothly, well, as smoothly as is possible. For the previous few years the scores were posted to the League Match Secretary who arranged for all 40 odd cards to be entered each week into the score system we had previously. Now the old system was programmed onto and used an Amiga computer. That’s right in 2014 we were using a program written in 1990 to work out the scores and leagues. That’s 24 years we were using the same program. When I came to be Chairman I took the task of updating the system used because the old one really had become obsolete, continuing to use it would have meant that when it did eventually fail the League would not have a backup. So we spent some money, quite a bit in fact, to build something that would last us and would be easy to manage. One of the things about the score cards is it takes a long time to enter them, sure the old way took about an hour to do but relied on someone from the Committee to have the time to manually enter the cards every week. Then the match scores had to be typed up for the newspapers and sent in. I don’t know about you but I don’t have that time available to me. I knew that whatever the new system we had it must have the ability to have the score cards added by the teams themselves, thereby saving a great deal of time. So it is a success? Well the system has been in a year and by and large I think it has been a success. Sure we have had teething troubles but nothing we cannot fix easily. 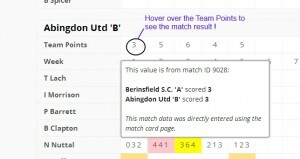 Did you know for instance that some people have said that the scores don’t add up correctly after adding? I shook my head at this for weeks until I saw that some people were putting an X in for a blob. Quite rightly so but of course databases don’t want to see an X they want to see a number 0 (zero!). I’ve had my website coding guy sort out the back end so that even when X is entered it reads it as a 0. Passwords and usernames have also been an issue. If you have contacted me chairman@abingdonauntsally or the webmaster@abingdonauntsally we have responded instantly and reset or changed your password. Some people are only contacting us through the contact page and for a while the emails weren’t getting through they are now so there was a hold up there I can only apologise for that. I think the biggest issue has been when some people can’t get into the site or can’t do it they give up and just send the card in without taking a copy. The issue here is we do not know which cards have been entered online and which have not. In fact there is no way without one of us sitting down and manually checking the 160 odd cards we have now accumulated. If we don’t have time to enter the 40 cards each week we definitely don’t have time to sort 160! I need to rely on you to check to ensure that the scores entered are correct for your games and contacting us when they are not – and some people have been and thank you for that. So it does help if you put the match ID on your card when you’ve entered it online. So far anyone with an issue other than password reset I have phoned and talked through the process. In one instance I’ve been and met up with the Captain and shown them how to do it, actually really enjoyed meeting the Captain of the other team. He now knows how to add the cards and we got to talk about Aunt Sally which is a topic I love and can talk about for hours. I want and need this to really work for all of us so that it’s easier for the Committee and more transparent for you as teams. It also means we can do some ‘stats’ – so we now have ranking reports that give you your player positions in the total league by average and by total dolls and the webmaster can pull out those sixes and ‘over 14s’ with relative ease as the data is all online. If you are having any issues at all or you just aren’t that confident with it, contact me by email. I will get back to you and help you with anything you need. I will even if you want me to arrange a time to meet with you and show you how to do it. If you have an opinion please hit the comment bubble below and speak up. (You’ll need to login).